Hot Chameleon comes with 8 predefined color schemes. This is one of those colorful WordPress themes that’s suitable for all tastes. 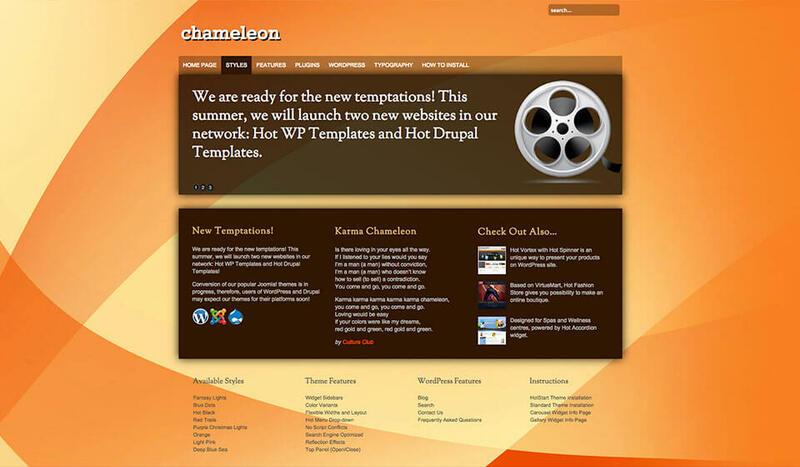 If you are looking for colorful WordPress themes for websites with vivid colors that don’t contain too much text, images or other content on a single page, the Hot Chameleon can be a good choice. It comes with 8 predefined color schemes and each of them contains unique abstract background image and color scheme. It’s also possible to use solid color for background, if you prefer that. Equipped with Hot WordPress Carousel Pro plugin (included in the theme package), this theme gives you ability to make slideshows of the selected posts and pages. We recommend using this feature on the home page of your WordPress site. Top menu with drop-down is based on jQuery and has several animation effects that you can select from the options page available in the colorful WordPress themes. 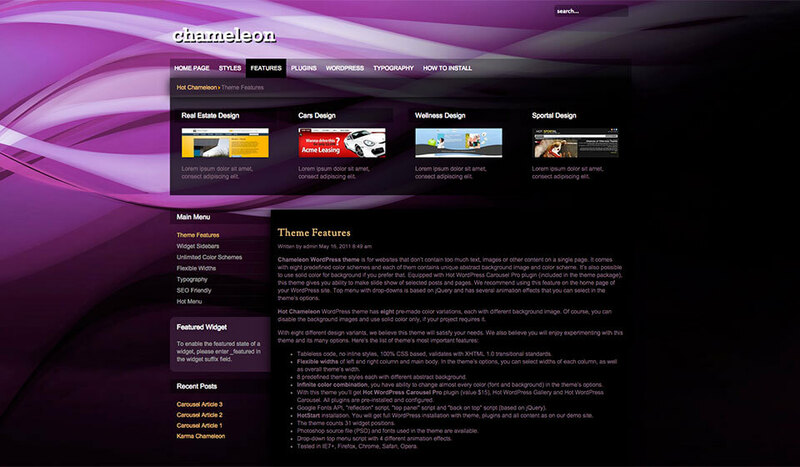 Hot Chameleon theme has 8 pre-defined color variations, each with different background image. Of course, you can disable the background images and use solid color only, if your project requires that. With 8 different variants of the design, we believe this theme will satisfy your needs. We also believe you will enjoy experimenting with this theme as it has many parameters that you can edit. The widths of the left and the right column and main body are parametrized. You can also select the overall theme’s width. Theme has infinite color combination. 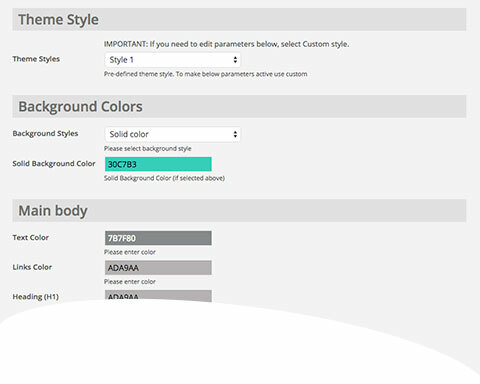 This means that you have ability to change almost every color (font and background) from the theme’s options. Google Fonts API, “reflection” script, “top panel” script and “back on top” script (based on jQuery) are incorporated in the Chameleon colorful WordPress theme. 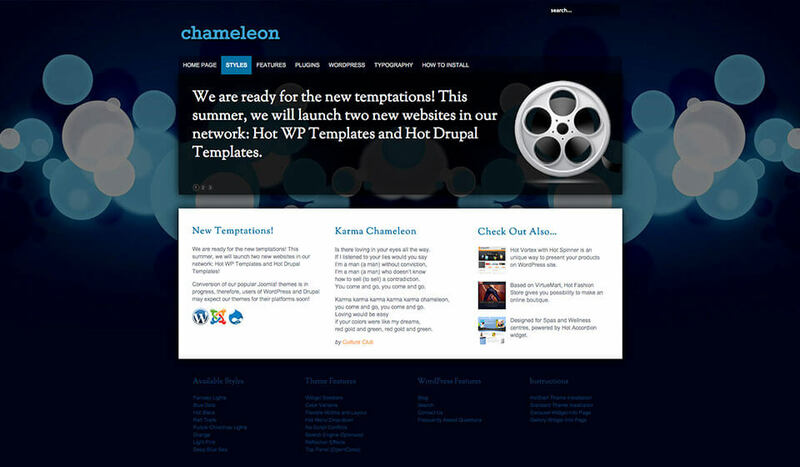 Hot Chameleon is a responsive WordPress theme. This means it will look good and optimized on all desktop and notebook computers, as well as mobile devices (tablets and smartphones)!